Instead of storing all those huge files directly on your iPhone or iPad, you can store a tremendous amount of music, movies, videos, photos, ebooks, work files, and much more directly on the iXflash portable mini storage device. That way you can play back, view, edit, or review all of your content through any iPhone, iPad, or iPod with a lightning connection*, or even directly through any computer with a USB connection, regardless of whether you have cellular service or wi-fi connection. For example, many airlines are charging for inflight entertainment these days. Instead of wasting your money paying the airline for a movie you’ll probably fall asleep on, you can bring your iXflash, which is loaded with your favorite programs and watch for free at your convenience. Perhaps you want to get some work done while on a flight, but don’t want to pull down a bulky laptop which you have to balance on the tiny tray from the seat in front of you. Instead, transfer your work files from your computer onto the iXflash through the USB3.0 connection, then you can review and work on all of your documents through your iPhone or iPad without needing extra space or internet access. There are so many possibilities with the iXflash beyond simply backing up photos and videos quickly. The iXflash can be your traveling media library or de facto external HDD, without using up your allotted data minutes or paying exorbitant fees for wi-fi, making the iXflash as essential to you as your iPhone itself. For more details about Vinpower and our expansive product line, please visit our website at www.vinpowerdigital.com, or contact a representative near you. *The Piodata iXflash APP is required for use with an iPhone or iPad and can be downloaded for free from the Apple App store. With the iXflash, you’ll no longer live in fear of missing the perfect picture/video or be forced to delete important images or Apps because your iPhone or iPad is running out of memory. 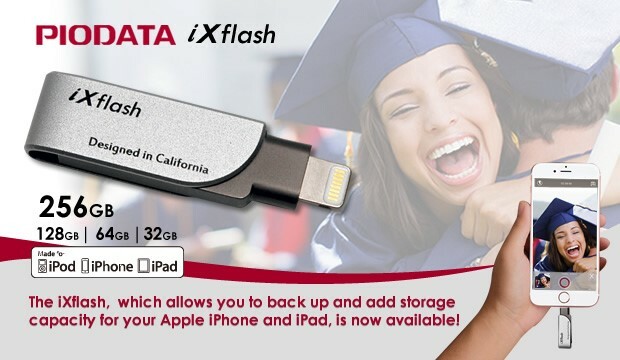 The iXflash provides extended memory for iPhones, iPads, and iPods with a Lightning connection. It allows you to take pictures and videos with confidence, watch HD quality feature length movies, and listen to music without sacrifice or requiring a connection to a computer or the internet. The iXflash frees you from the limitations of your storage capacity and opens up a world of possibilities! • Small device – HUGE CAPACITY: With added storage capacity of 32GB, 64GB, 128Gb, up to 256GB, you should never worry about running out of storage capacity on your iPhone or iPad. Never again will you be frustrated by messages that say, “Cannot Take Photo,” because there’s no more space for new photo’s or videos. • Direct Photo/Video Capture: The iXflash allows you to take real time photos and videos that transfer directly to the iXflash’s internal memory, without using the memory on your iPhone, iPad, or iPod. • TRANSFER BETWEEN ALL YOUR DEVICES: The iXflash can quickly and easily transfer content between multiple iPhones or iPads, allowing you to share all or select photos and videos with friends and family quickly and securely. Plus, with the USB 3.1 connection, you can back up all your content onto a computer or transfer content from a computer to view or listen to on your iPhone or iPad. • Saves Battery Life: The iXflash saves on battery life by going into low power mode when backing up your photos and videos, preserving your battery and not disrupting your iPhone or iPad’s primary functionality. • Photo/Video PROTECTION: The iXflash supports the Apple Touch ID feature to safeguard your photos and videos by locking access through fingerprint identification. This feature will protect any file stored on the iXflash from being viewed through an Apple mobile device or through a computer to ensure complete privacy. • APPLE MFi CERTIFIED: The iXflash devices are engineered to meet Apple’s stringent design specifications and are MFI (Made for iPhone/iPad/iPod) Certified. 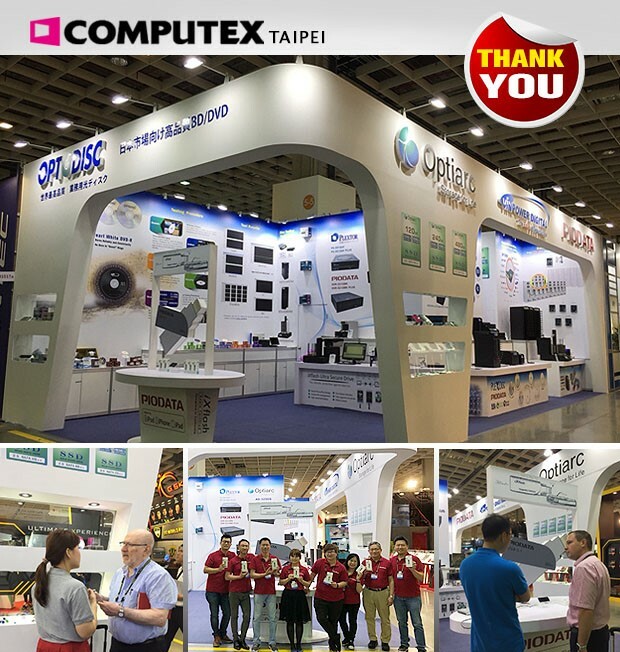 Vinpower Digital would like to thank everyone that visited our booth at the 2018 Computex trade show in Taiwan. • and many other offerings. For those who unfortunately could not visit us at Computex, you are always welcome to contact us directly at one of our branch offices in the USA, Taiwan, China, or Europe. We thank all of our loyal and happy customers, partners, and friends and look forward to continued advancements and success throughout this year and beyond! 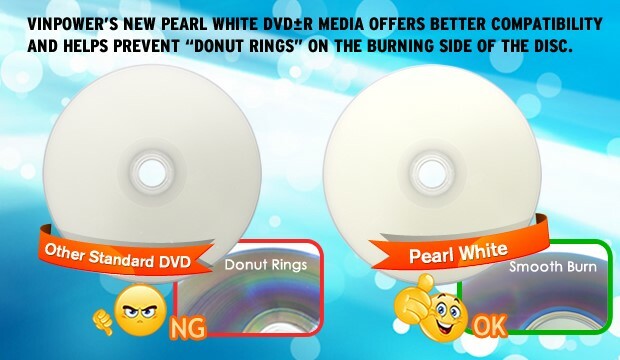 For more details about the Pearl White media or any product in the Vinpower offering, please visit our website at www.vinpowerdigital.com, or contact a representative near you. 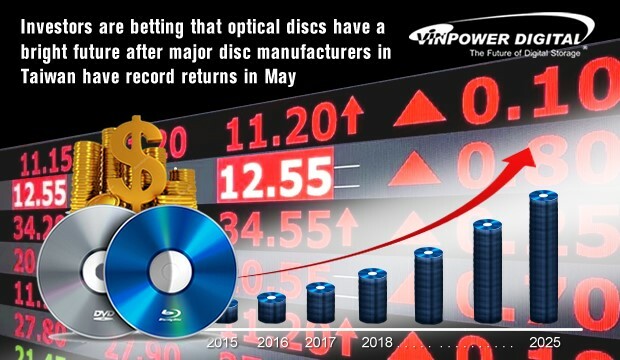 For more details about Optodisc media or any product in the Vinpower offering, please visit our website at www.vinpowerdigital.com, or contact a representative near you.